As much as I love video games, I’m just not a PC gamer. My day job sees me sitting at a PC all day, so when I get home from work that’s really not where I want to be. For the most part, my Xbox One fills my gaming requirements; however, there’s one thing I do feel I miss out on being a console-only gamer, and that’s strategy games. There are a few to be found if you dig hard enough, but the Xbox One is, for the most part, in a serious strategy drought. So when I heard that Double Eleven was bringing Introversion’s acclaimed management sim Prison Architect to Xbox One, I jumped at the chance to have a play. 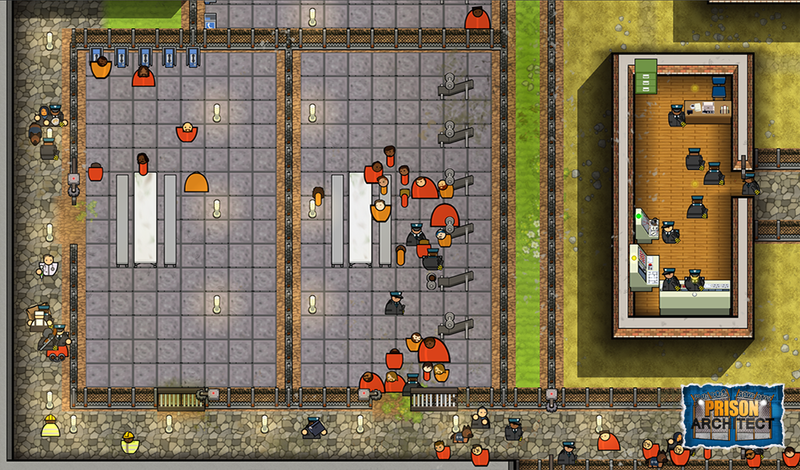 Prison Architect is currently available as part of the Xbox One Games Preview program, meaning it’s still a work in progress, but there’s plenty of gameplay available to sink your teeth into. The first place you’ll want to visit is the Prison Stories mode, which basically acts as an in-depth tutorial on how to play the main sandbox mode. You take on the role of the new prison warden, learning how to build and power your prison, hiring staff and making sure they do their job. 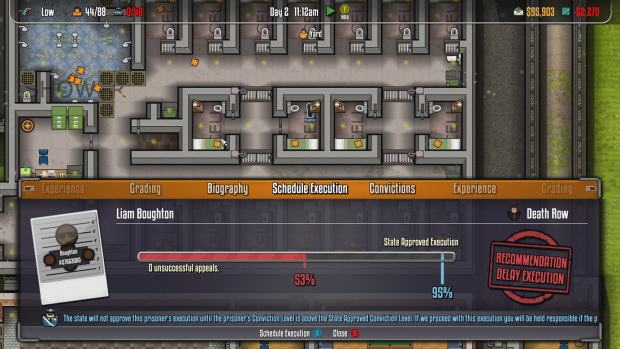 You also learn about managing prisoner needs and how to deal with any emergencies that may result from bad decisions. For example, you can choose to keep your inmates happy and submit to their every whim building gyms and common rooms and handing out TVs to all, or you can lock them all in solitary for complaining too much. Of course, the latter runs the risk of them rebelling. The campaign itself reminded me of Bullfrog Productions’ classic Theme Hospital, as the CEO will call you up with various tasks and advise you of any pending problems with the prison. The comparison to the somewhat sillier Theme Hospital, however, ends there. Prison Architect is a much darker affair: your initial task, for instance, is to prepare the prison for its first execution. Later we learn about backstabbing mobsters, rioting prisoners and prison brutality. (Not quite the same as Bloaty Head Syndrome!) At the end of each mission, somber scenes are played out on some gritty Polaroid-style snaps, which also double as in-game collectibles. Four story missions are currently available, with a fifth still in development; each can take an hour or so to work through. The pacing is fairly slow at times, and I soon found myself itching to be allowed some free reign. However, I recommend that you do take your time here. There’s a lot of information to absorb, and despite making my way through Prison Stories mode, I felt pretty overwhelmed and missed the gentle hand-holding featured in the tutorial. Luckily, there are plenty of entry points. You can choose to either start your prison design from scratch, which is essentially the main crux of the game, or you can play on a pre-built prison in Warden Mode. Feeling a bit lost, I gave Warden Mode a go. Each of these starter maps are listed by size and difficulty, but you can still change a lot of gameplay settings such as how often emergencies occur and what types of inmates you would prefer, tailoring the game to suit your play style and experience level. Later you’ll be able to upload your own designs and download pre-made prisons from other players through World of Wardens mode, though this is currently locked in the preview build. 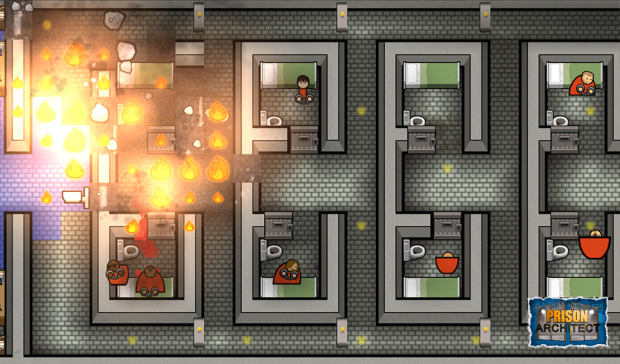 Prison Architect is probably one of the most intricate strategy games to hit the Xbox One. 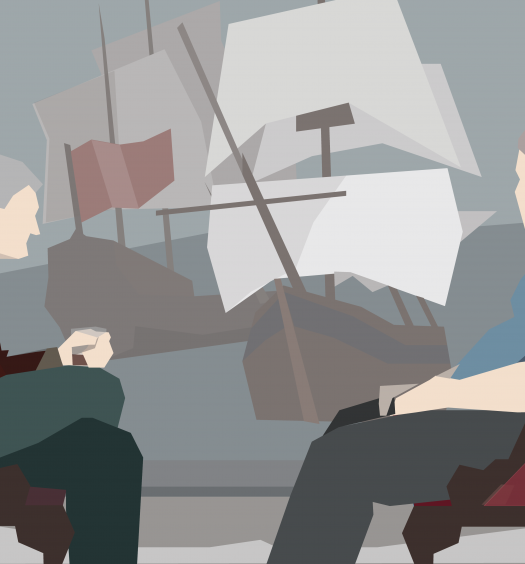 Double Eleven certainly hasn’t tone down the challenge by trying to make a Prison Architect-lite for consoles: this version keeps the original’s depth and creativity. Despite this complexity, the game controls well, and the vast menu system is easily navigated using the D-pad and bumper buttons. Mouse controls are also intuitively replicated using the sticks and face buttons. I did hit a few niggles with progression, but mostly I found this to be due to my understanding rather than the game bugging out. 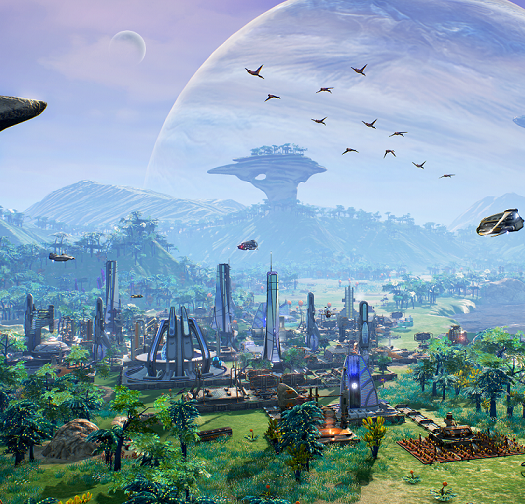 This is a complex strategy game complete with a steep learning curve, but it’s exactly what the console needs right now.